Hello and happy February! How is it here already?! I am convinced time keeps speeding up. 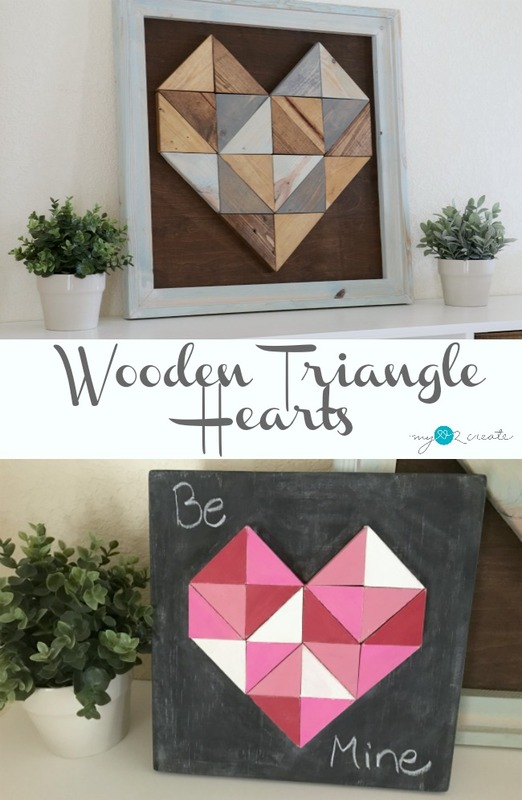 Since we are approaching Valentine's day I am so excited to show you how to make a wooden triangle heart! I promise this is super easy, and you can customize your hearts anyway you want! 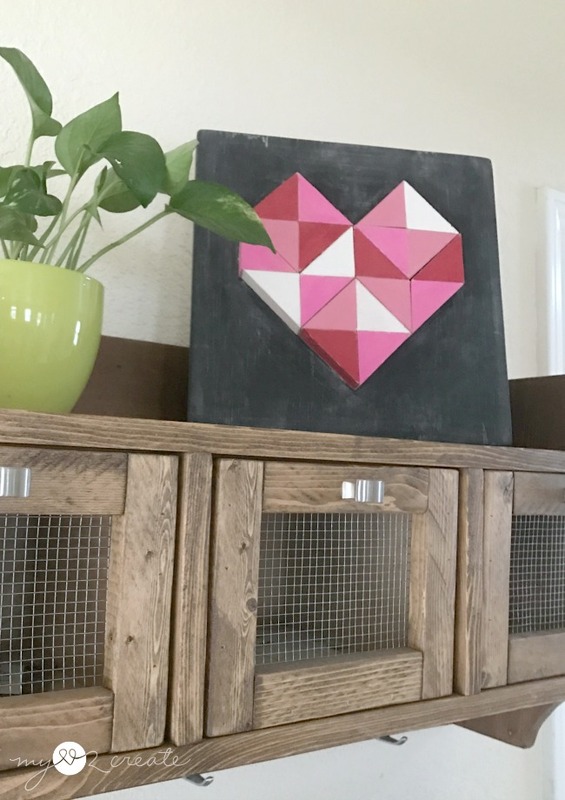 I spotted this printable from Kiki and Company and fell in love with it, so I had to make my own, but out of wood...of course! 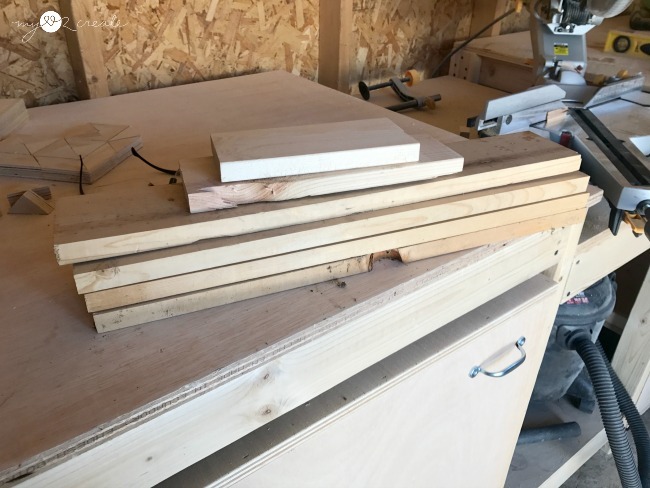 I set my saw at 45 degrees and grabbed some scrap plywood strips (FYI- they just happen to be 1 1/2'' wide, the exact size of a 1x2 board) to see if it would work. And it did! Woo hoo! Supplies: This post contains Affiliate Links that help me at no cost to you, thank you! Read more. 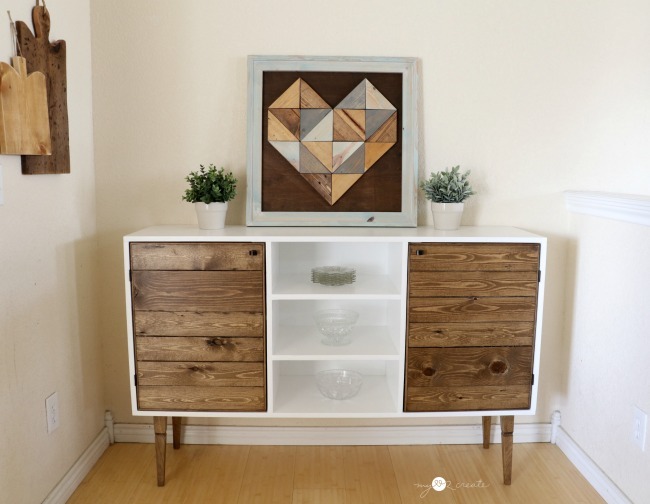 Gather scrap wood or your 1x4x8 board. I love to use up scraps for this kind of project. Set your miter saw to 45 degrees. You will be cutting 20 isosceles (two sides of equal length) triangles, or right angle triangles (one angle is 90 degrees). First cut off the end. Then flip your board over and line up your blade to the corner and cut your triangle. 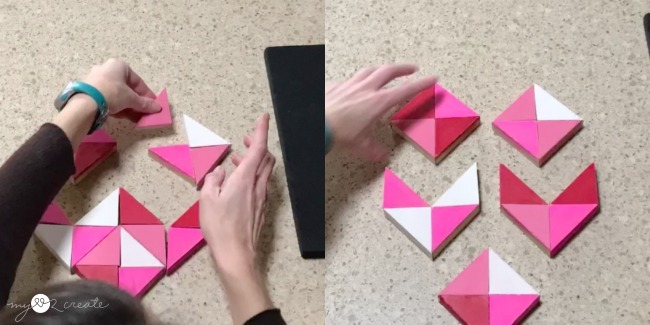 Remove your triangle, flip the board, and cut, then repeat until you have twenty pieces. 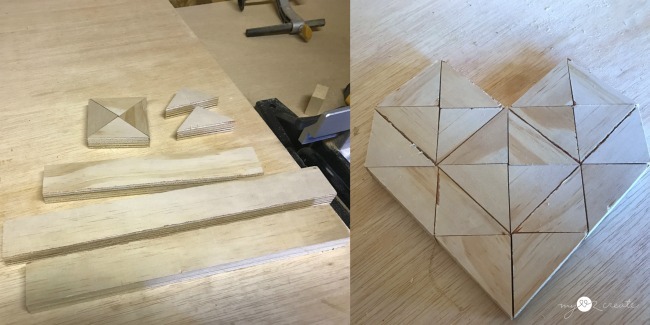 Don't stress if your triangles are not all perfectly the same size, unless you create a stop, they will probably vary slightly. For a decorative art piece I didn't stress about it, it adds character, and I am lazy! 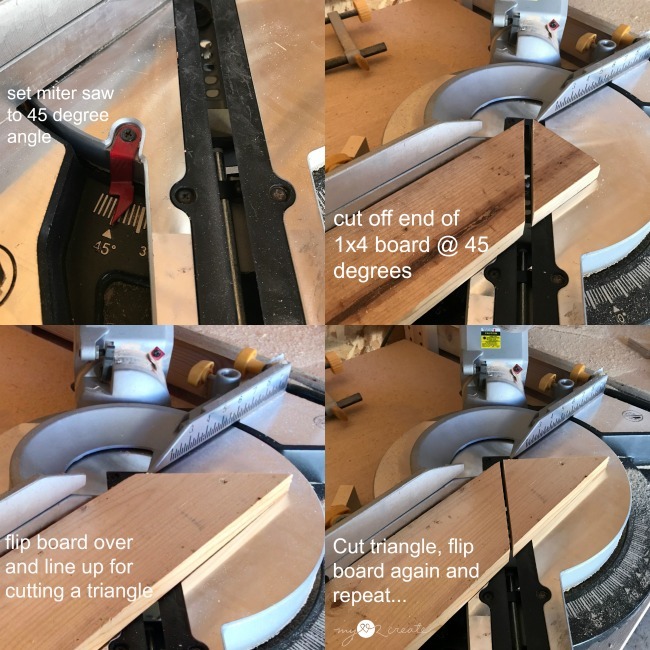 You can create a stop by clamping a board onto your miter saw that is cut at a 45 degree angle so you can just push your board up to it each time. 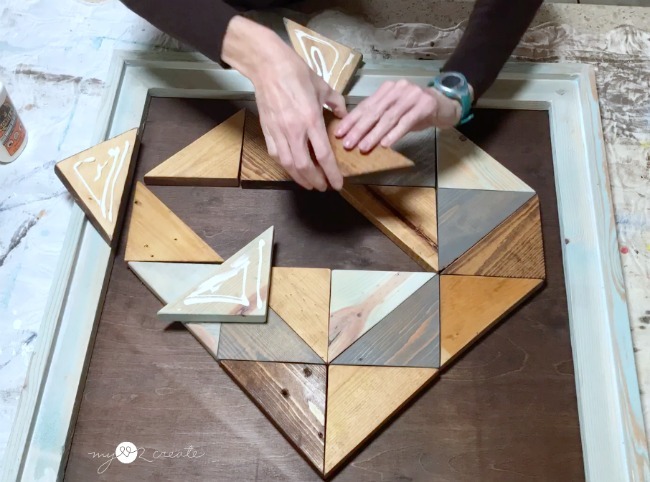 If you read through my DIY Hexagon Planters post you can see how I did the stop to cut my wood accurately each time. After I cut my pieces I lightly sanded the edges and corners. Here I am doing a dry fit of my hearts. You can see the size difference in the 1x2 size and the 1x4 size. 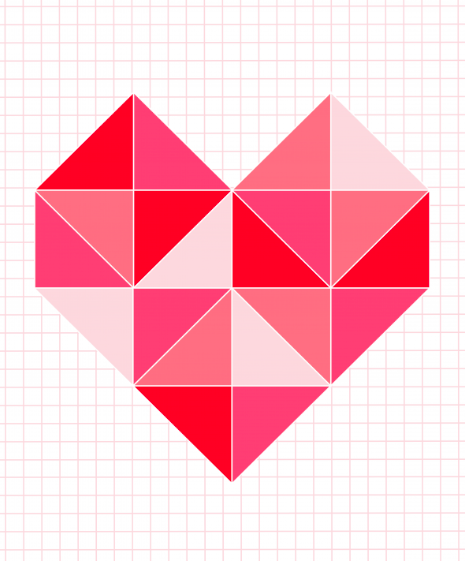 A finished 1x2 heart is just over 8'' square, and the 1x4 heart is 19 1/4'' square. You can stain or paint any pattern you desire for your hearts. I did four different stains for my heart. 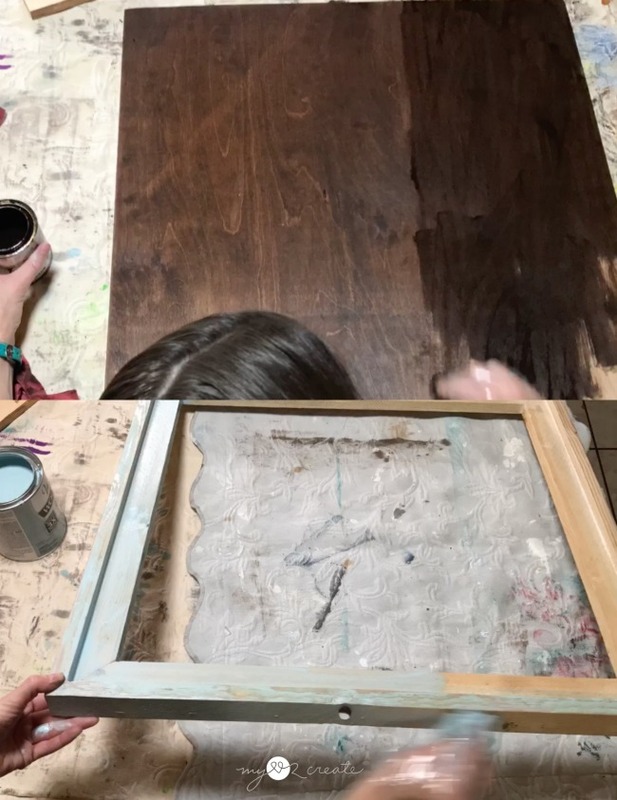 The dark stain is Rust-Oleum Kona (top left), the lighter is Minwax Golden Pecan (top right), the dark gray is Rust-Oleum Weathered Gray (bottom left), and the light blue is Rust-Oleum Bleached Blue Varathane (bottom right). 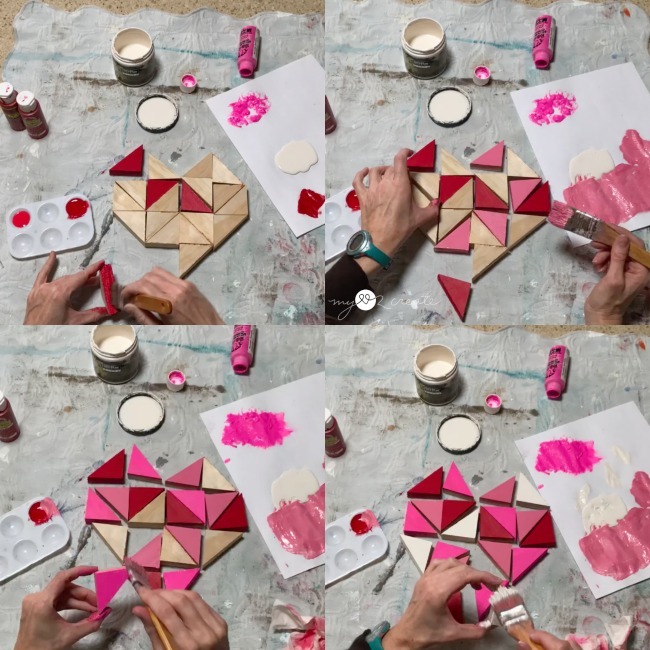 I followed a similar pattern with my painted heart using red, two different shades of pink, and a cream color. I choose to stain my back board in Rust-Oleum Kona , and my frame in Rust-Oleum Bleached Blue Varathane . When staining apply the stain with a rag or a brush and then remove it with a clean cloth. I like to remove it pretty quickly when I am working with Rustoleum stain so I work in smaller sections. If I am using Minwax stain I can let it sit on the wood longer. This step can be done before you stain or paint. 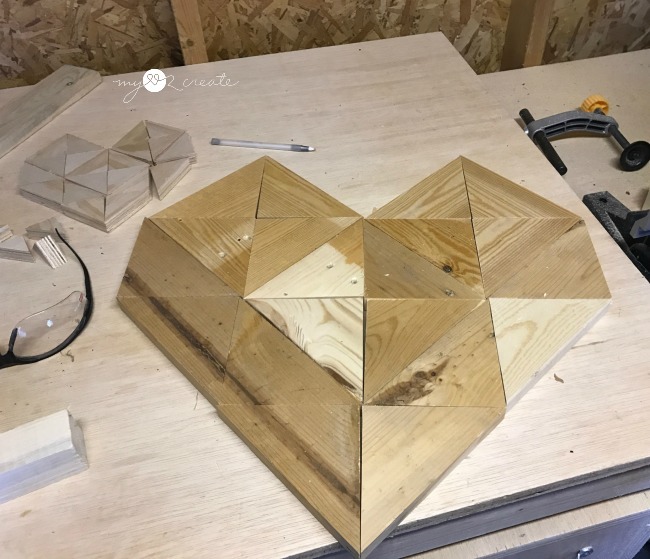 I cut a piece of 1/4'' scrap plywood for my stained heart at about 23'' square so I could fit it into my Barn Wood Frame that is 25 1/2'' square. I had this frame from years ago, it was one of my first builds and I was practicing on scrap wood...I have never used it until now...finally! For my painted heart I cut a scrap piece of 3/4'' plywood at 11 1/2'' square. Then I gave it a few coats of Rust-Oleum Chalkboard Spray paint. For more accurate placement I set my heart where I wanted it on my board, and then a few triangles at a time I added wood glue to the back and re-placed them on the board. Once all the pieces were glued I added books for weight while it dried. For my painted heart I tried gluing the smaller heart sections together first, and the glued them to each other to complete the heart. Next I added the heart to the board. 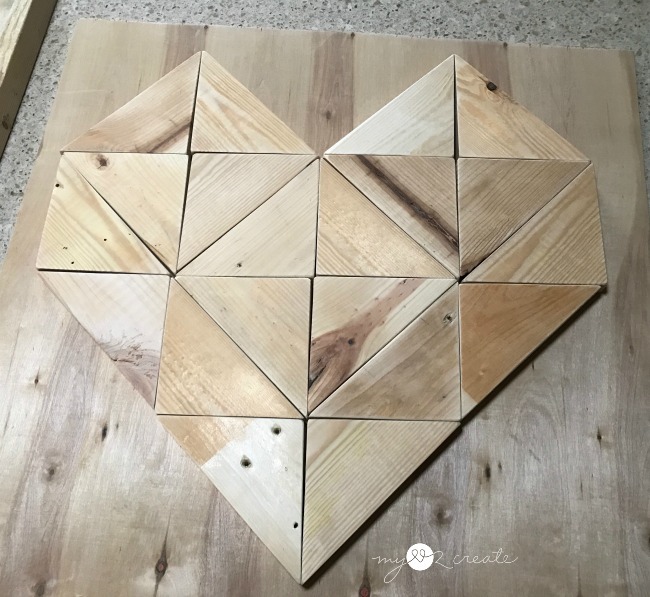 This method would work great if you were patient and waited for the heart pieces to dry before you tried to add it to the board...just sayin. I attached the 1/4'' plywood to the back of my frame with 1/2'' screws and that was it! DONE! You can also add a protective clear coat if you desire. 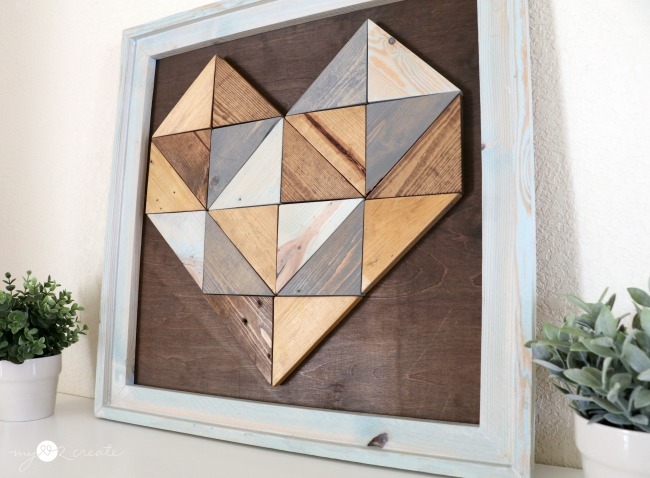 Then enjoy your beautiful wooden triangle heart!! 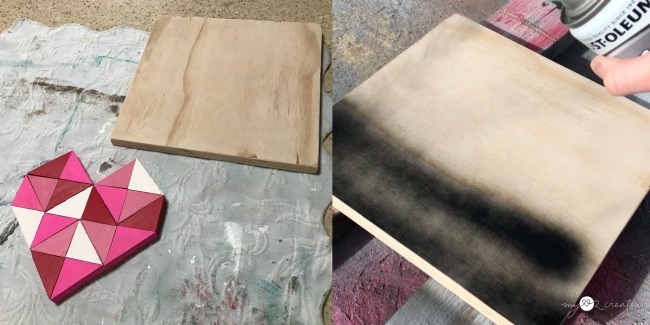 If you add a chalkboard finish to your board like I did, be sure and prime it before you use it. I kind of love how this one turned out, my pink loving daughter said it is her favorite. I am also loving the stained look too! 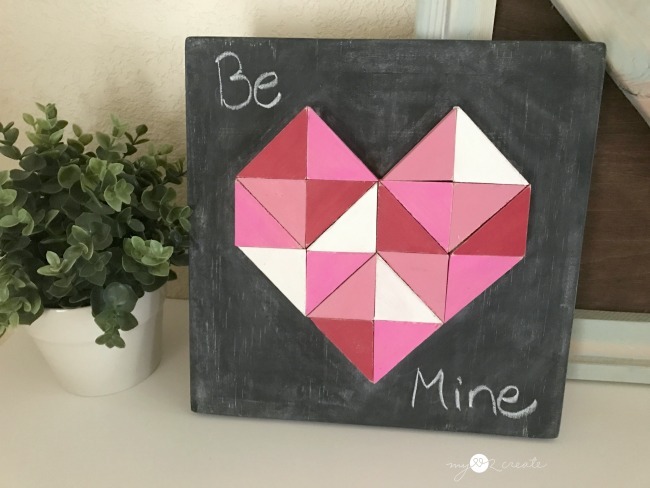 Either way they are a fun and easy project for adding some Valentine's cheer to your home. 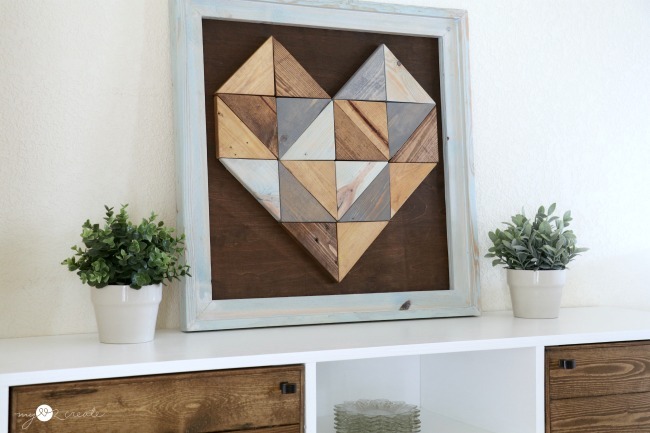 This larger heart sits perfectly on my Modern Rustic Buffet. Here is a shot of both of them together. This way you can easily see the different patterns of how I put down the triangles. Which one do you like better? I like them both, I always have a hard time choosing favorites. Now how about some more Heart inspiration? I am so thrilled to be joining with some of my favorite creative bloggers to bring you The Makers Heart Attach! 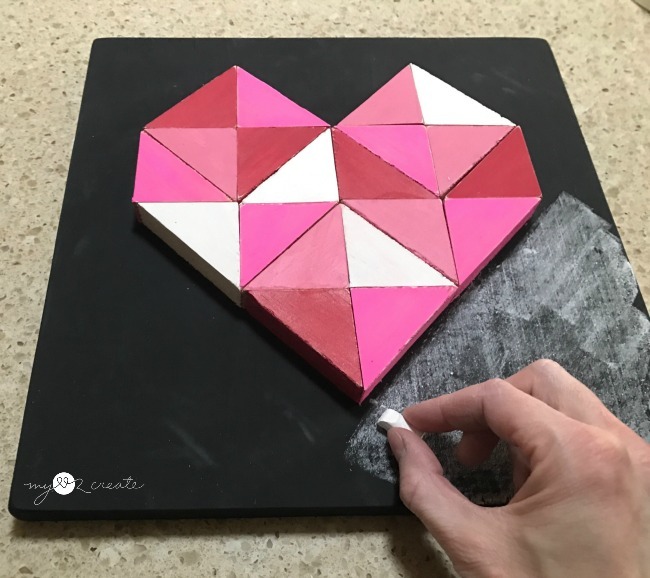 We are trying to spread the love and give you some awesome creative heart projects! 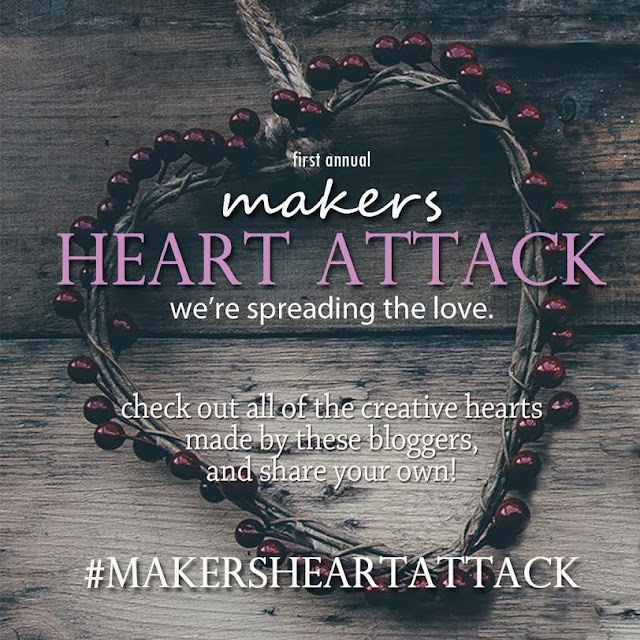 Plus share your own heart project and tag @mylove2Create and the #makersheartattack so we can see your amazing work as well! Now to see more heart inspiration! Be sure to check out all the heart projects below! 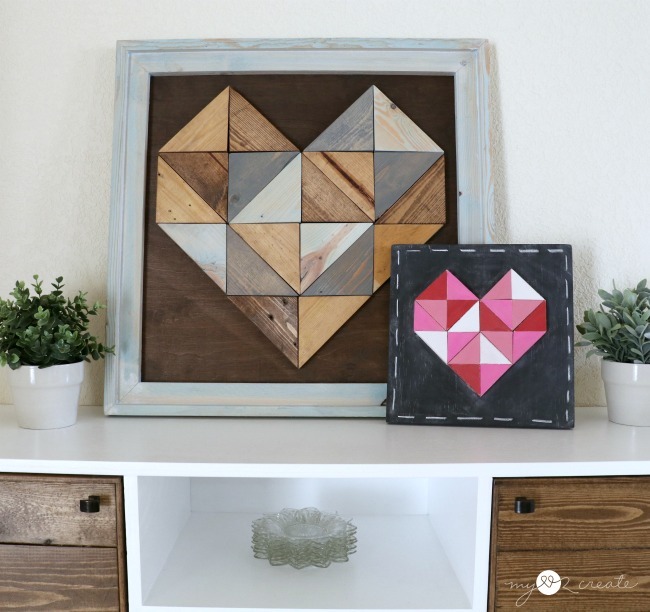 Mindi @mylove2create - Wooden Triangle Heart That's Me! 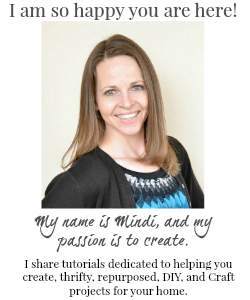 So cool, Mindi! 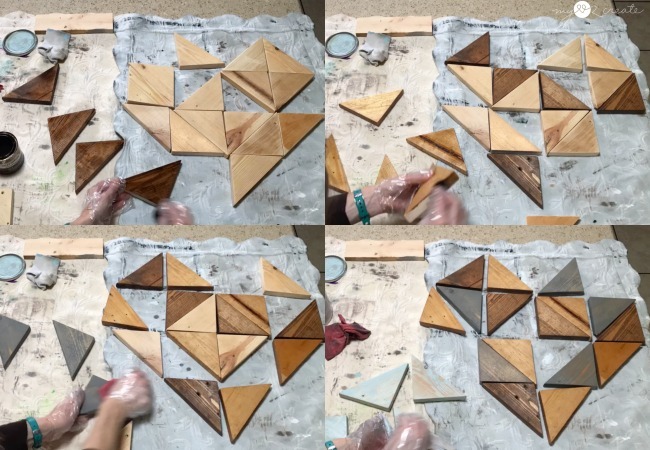 Just today I was working on some quilt squares made out of wood! Now I'll have to make some hearts, thanks. 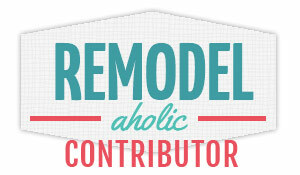 Love it, thanks for the tutorial and thank you for linking up to the Talk of the Town Link Party. I think I will make one today.